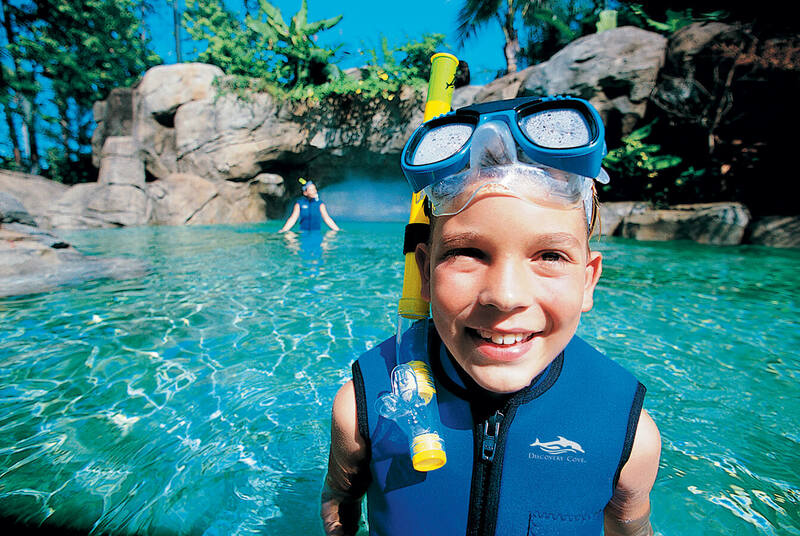 If you’re planning a day at Discovery Cove, the SeaVenture experience is an absolute must-do! 1. What exactly IS SeaVenture? In a nutshell, an underwater walking tour where you can see sharks, fish and other tropical sea creatures up-close. 2. Who can take part? Participants must be at least 10 years of age and in good physical health. 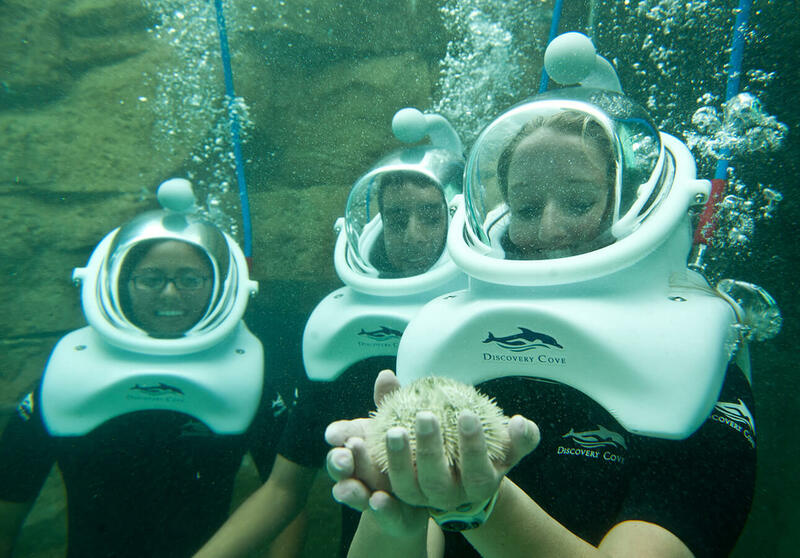 Anyone under the age of 14 must also be accompanied by an adult who is taking part in the experience. 3. Do you need any diving experience? Nope! No diving experience or SCUBA certification is required. Experienced guides will accompany you throughout the tour to ensure you feel 100% safe. 4. How long does the experience last? Around 1 hour in total. The initial safety briefing takes about 20-30 minutes, then you’ll spend approximately 20 minutes underwater. 5. What happens during the safety briefing? You’ll watch a short video which explains how the dive helmets work, how to stay safe underwater and how to communicate while you’re down there. Your guide will also be on hand to answer any questions you may have. 6. How heavy are the dive helmets? 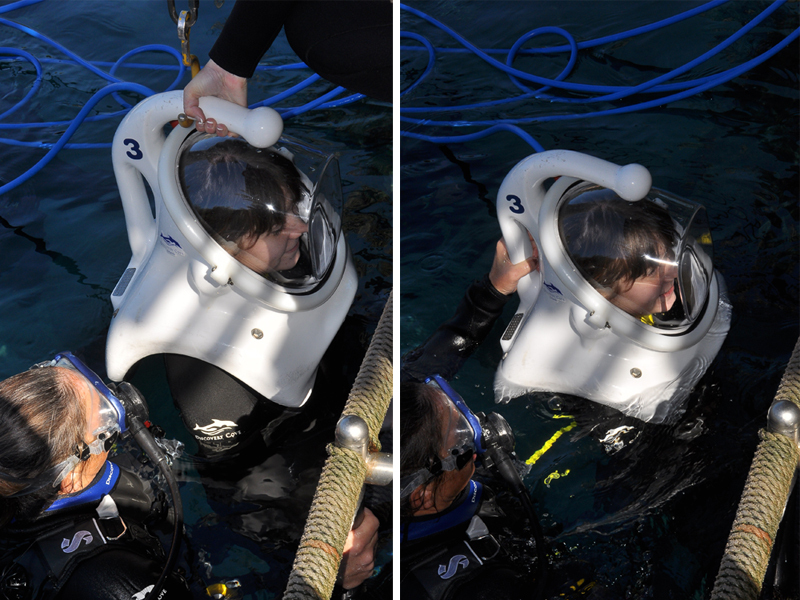 The helmets weigh around 70lbs outside the water, and around 15lbs in water. When it’s your turn to put on your helmet, you’ll be asked to step part way down the ladder so you’re partially submerged underwater. The helmet will then be lowered slowly over your head as you descend. This ensures you don’t ever bear the full weight on your shoulders. 7. How do you communicate underwater? Most communication is done through hand signals, which you’ll learn and practice during the initial safety briefing. Your guide may also use a special underwater whiteboard tablet and pen to ask questions. 8. What does it feel like underwater? 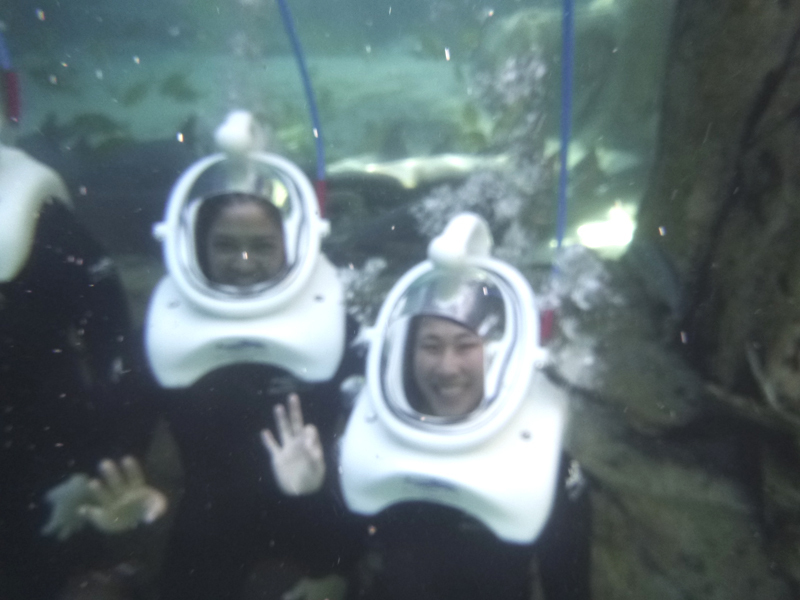 Kind of like what you’d imagine walking on the moon feels like… but surrounded by fish! 9. What animals can you see down there? 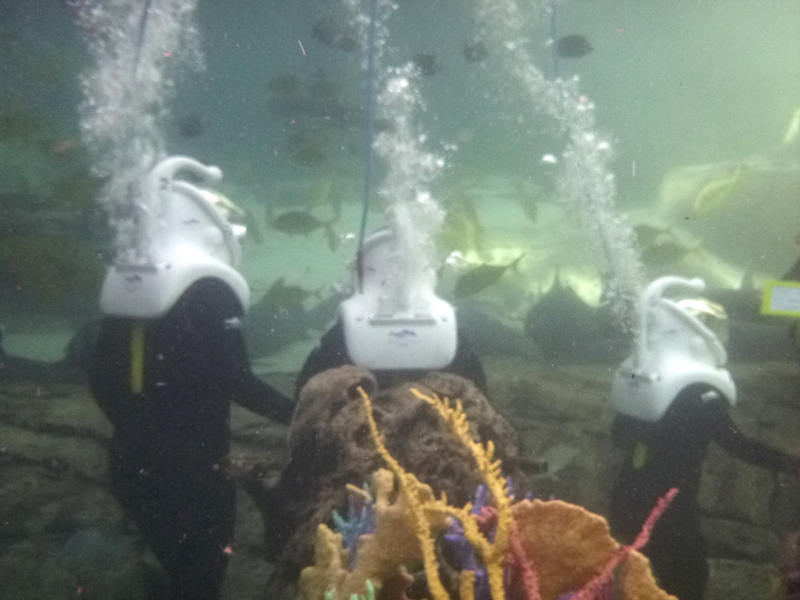 As you walk along the reef floor you’ll be surrounded by schools of tropical fish and rays, before coming face-to-face with sharks. Don’t worry – they’re safely located behind a glass window! You’ll also have the opportunity to hold creatures like starfish and horseshoe crabs. 10. Sounds amazing! How do I book? SeaVenture can be booked as an addition to your Discovery Cove tickets. 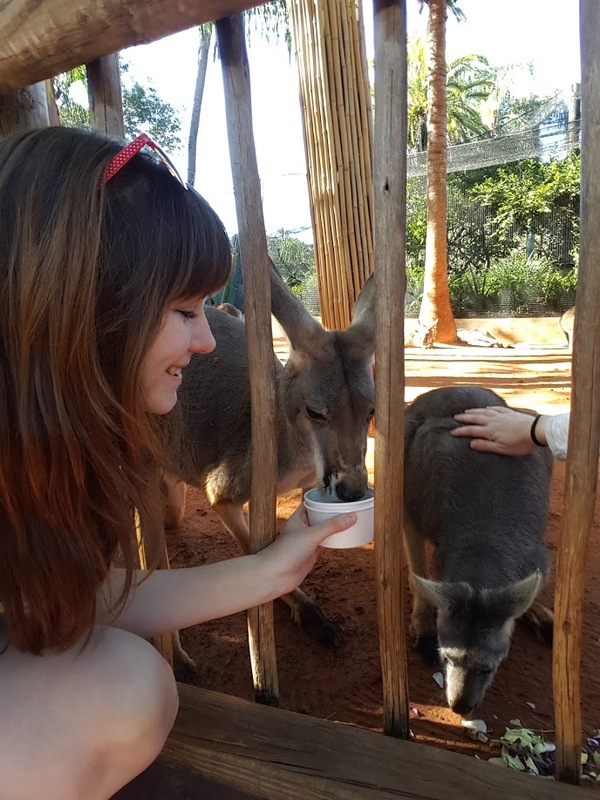 As they only take small groups, places on SeaVenture are very limited so it’s strongly recommended that you book in advance to secure your place!